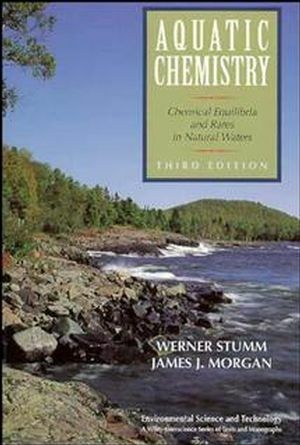 Now in its updated and expanded Third Edition, Aquatic Chemistry remains the classic resource on the essential concepts of natural water chemistry. Designed for both self-study and classroom use, this book builds a solid foundation in the general principles of natural water chemistry and then proceeds to a thorough treatment of more advanced topics. Key principles are illustrated with a wide range of quantitative models, examples, and problem-solving methods. WERNER STUMM is an internationally renowned aquatic scientist at the Federal Institute for Environmental Science and Technology, EAWAG, Swiss Federal Institute of Technology, ETH. His numerous publications include Chemistry of the Solid-Water Interface, Aquatic Chemical Kinetics, and Aquatic Surface Chemistry, all published by Wiley. JAMES J. MORGAN is Marvin L. Goldberger Professor of Environmental Engineering Science at the California Institute of Technology. Professor Morgan was the founding editor of Environmental Science and Technology. He is also a recipient of the American Chemical Society Award for Creative Advances in Environmental Science and Technology.